"May Announce Engagement of Royal Princess"
The Morning Citizen today said in a news-page story that it was "understood here on the highest authority" that the engagement of Princess Elizabeth, heiress presumptive to the British throne, to Lieut. Philip Mountbatten, formerly Prince Philip of Greece, will be announced next Monday on the Princess' 21st birthday. ...but I can say that this April, I have an official engagement announcement of my own! My wonderful boyfriend, Mark, proposed this weekend, and I happily accepted. Here we are, looking very happy shortly after he popped the question! 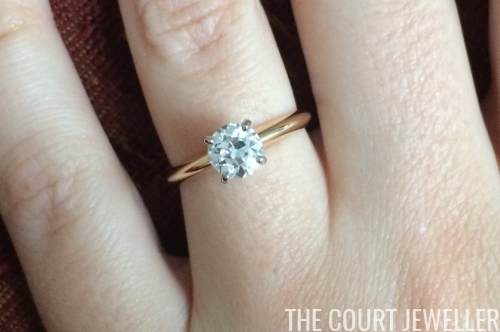 The ring is my perfect dream engagement ring: a simple, creamy gold band, set with an old European cut diamond. I love that the diamond is an antique stone, cut by hand more than a century ago! 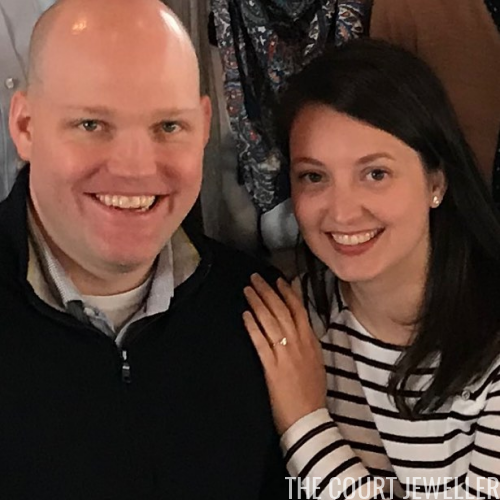 The ring was made by David Kodner, a talented jeweler in our hometown of St. Louis. (I'd highly recommend him to anyone in the area looking to make a jewelry purchase -- our experience has been fantastic!) We're planning to get married next year, and although I generally don't talk much about my real life on this blog, I'll be sure to let you in on a few sparkly moments from that experience!